Ayase is an amazing and determined young girl who is paralyzed from waist down and uses a wheelchair. She is also Funeral Parlor's sole Endlave combat pilot. She can't stand feeling dependent on others, so she firmly rejects any and all help from others. There are two things Ayase dislikes more than anything—being offered help by others because of her disability and if someone is watching her while she is trying to crawl back into her wheelchair on her own. She believes the process itself doesn't make her look very elegant. Even though Ayase is disabled, she is valued and respected by all Funeral Parlor members for her Endlave piloting skills. This paralyzed girl makes her Endlave which weighs many tons of armor grade steel-alloy move on the battlefield with an uncanny precision. 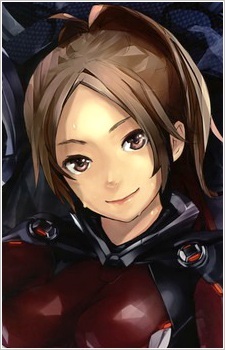 Ayase being the only pilot of Endlave mobile combat platform is instrumental to all Funeral Parlor operations. Her primary job is to draw the attention of the enemy Endlaves away from Funeral Parlor's main objectives and provide support and cover for other Units. Most of the time during combat Ayase finds herself outnumbered at least three to one, but still is able to hold her own against enemy Endlaves. Originally, she piloted an older Endlave Jumeau model before it was destroyed by Daryl, but later gains Daryl's Endlave Steiner model. Ayase has feelings for Gai and is very loyal to him. She was eager to accept all responsibility for losing her original Endlave in combat, after successfully holding off multiple, newer and more advanced enemy Endlave models with her older model for 18 minutes. After listening to her report, Gai simply tells her that the fault is his own and that he is not fit to be the Undertaker's Commander for giving her such cruel order, to which she blushed furiously. At first, Ayase is apprehensive toward Shu, because of his lack of firm character and indecisiveness, but later on she warms up to him as she starts to see him change as a person and yet remain the same as a human being.